Will be making this pattern ... and other patterns .... available for sale at YouPatch very soon. 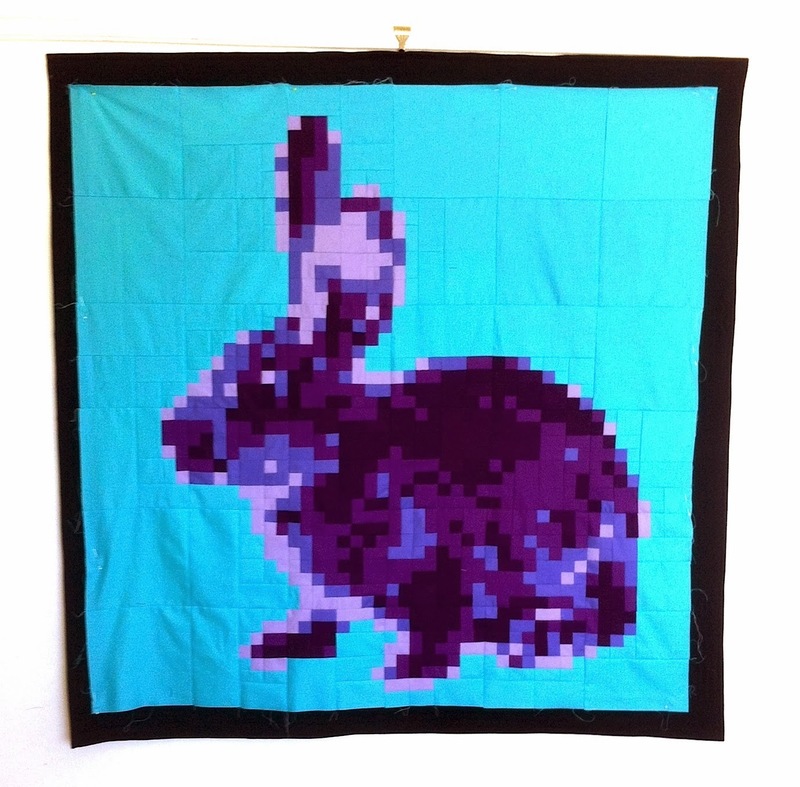 Fancy stitching an easter bunny? PS Linking up with Kirsty's "My Creative Space" today. I had a birthday recently. My husband is not so great at selecting a good gift for me so now I send him suggestions of things I might like. Can you see what I'm sewing on there? Another gift!! A baby quilt in Dr Seuss fabrics for Webmaster John's new baby boy, due in a couple of weeks. Another act of giving I'm participating in is a signature quilt block for Victoria. Her quilt is going to be so much fun once it's finished!!! Have you received or given any gifts lately? Maybe a Valentines Day gift? We are live and couldn't be more excited!! Head over to www.youpatch.com and have a play. Please let me know what you think of the site, the video tutorials, the design pages. I'd be incredibly grateful. It would be especially awesome if you told us about any bugs or problems you experience with the site. That way, we can go and fix them!! PS We have a special discount offer for the first few days. Go check it out!! Bug reports most welcome: it's early days! When my dear friend Judy discovered that she would be needing a bone marrow transplant it was a VERY big deal. This procedure involves a worldwide search for a suitable donor (found!! ), an intense period of chemotherapy (and all the nasties that go with that) and then a period of weeks (if not months) in the hospital for the transplant and aftercare. While Judy lives in Melbourne, most of her family are in Sydney. So she has developed a network of friends in Melbourne via her crafting world and through her work as a teacher. Judy didn't want to spend all that time in hospital without some connection to her friends and crafting community. So she asked a group of close friends to contribute a block towards a quilt that will be laid over her hospital bed to keep her warm and comforted. Here it is .... all pieced and quilted. The binding is attached on the front and Judy plans to hand stitch the binding to the back of the quilt herself. We selected a floral quilting design for Judy who loves her garden. The long-arm quilter (Kylie Cannon) did a beautiful job! You can really see the quilting design on the back of the quilt which is a Michael Miller ta-dot in watermelon and grey. I'm so glad Judy will have her quilt with her during this tricky time in hospital. She won't be able to have too many visitors while her immune system is so compromised so at least she will have her friends 'with her' in the form of this gorgeous friendship quilt. Have you been involved in contributing to a friendship quilt? Have you been lucky enough to receive one yourself? Such a wonderful way to say "we love you!" I'll be back on Tuesday with BIG news!!! !